12V LED spotlight bulbs are fantastic for off-grid lighting needs. They are cheap, use just 1 Watt of power, cast a bright white light, and 12V LED lighting circuits are very easy to implement. The only problem is the need for a 12 volt power source – typically a 12V sealed lead acid battery. These are typically large, heavy, difficult to handle, and expensive. In this article we will investigate how a DC-DC step-up converter can be used to enable a 12V LED spotlight bulb to be powered by four inexpensive rechargeable AA batteries. In order to step up the voltage output from four rechargeable AA batteries from around 5 Volts to the required 12 Volts the following circuit is used. 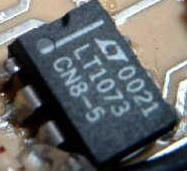 The key component is the LT1073-12 DC/DC Converter Chip from Linear Technology. 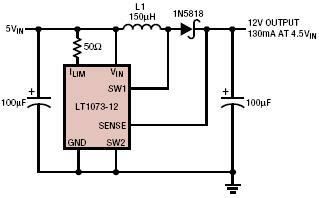 Click here for the comprehensive LT1073 Specification Sheet which includes many example circuits using this chip. This £2 device (the 5V output version LT1073-5 is pictured above) requires just a few off-the-shelf components and operates with supply voltages from 1V to 30V. The only additional components required to use an LT1073-12 as a 5V-12V DC/DC converter are a150uH inductor, two 100uF capacitors,and a 50 Ohm Resistor. Total cost of these components is around £1. In order to light a typical 12V LED spotlight with 4 AA rechargeable batteries, the 4 batteries (in series) are connected as the input of the circuit. At a nominal 1.2V each these batteries will easily provide the 5V required when fully charged, and the circuit will continue to operate even when the batteries are virtually drained providing just 4V. The LED spotlight bulb is connected directly to the output from the circuit. 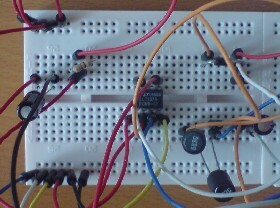 Above is shown the completed circuit put together on prototyping breadboard. The rechargeable batteries were placed into suitable battery holders, and the LED spotlight bulb plugged into an MR16 ceramic bulb holder. Stepping up from 5V to 12V comes at a price – a loss of energy in the converter circuit. In the example introduced above, an input current of 278 mA at 4.92 Volts is converted resulting in an output current of 70 mA at 11.69 Volts flowing through the LED spotlight bulb. According to Ohm’s Law, power is equal to voltage multiplied by current, so the batteries supply 1.37 Watts of power of which 0.818 Watts is used in the LED bulb – a power efficiency of around 60%. Recharging the four AA rechargeable batteries can easily be achieved using a suitable 6V Solar Panel making this set-up perfect for renewable shed lighting or other off-grid lighting applications where light is not needed for more than a few hours per day. As the schematic above shows, the power switch for the LED spotlight bulb is located before the DC/DC converter so that no energy is wasted in the converter circuit when the bulb is switched off. As an added advantage, if AA batteries are required for other devices, the batteries from the lighting circuit charged by solar power can be used and replaced with another set of batteries for charging. 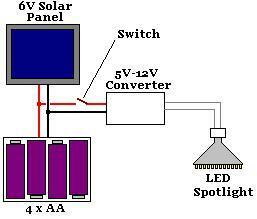 For more information on shed and garage solar lighting click here.